Glenn Saxson stars in an enjoyable early Spaghetti Western from Alberto De Martino. Cinema Club R2 UK DVD. 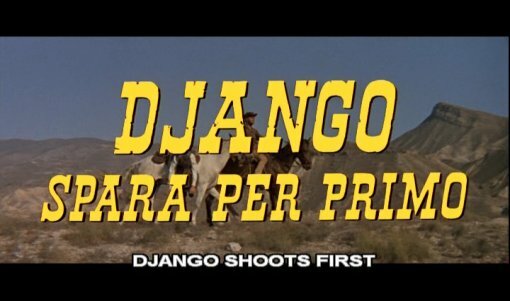 Although the from the synopsis it seems rather simple, Django Shoots First is a very well scripted film with good characters and with none of the gratuitous gun-fights and action that plague many films in the genre. Unlike many Spaghetti Westerns, Django here is just a normal man - a better than average gun-slinger perhaps, but not the invincible avenging-angel he seems to be in some of the other stories - this helps to create more tension, as we get a character who really could get hurt or killed. The villian, Kluster, is a rounded character and avoids the 'pure evil' streak of many of his counterparts, while the two female 'love interests' are more than just two-dimensional characters. The film is paced normally for a Western and has some nice twists and turns, there are various fist and gun-fights included that are all plausibly written into the story. On the negative side the ending is rather drawn out for a cheap gag and there is a ridiculous bar-room brawl toward the end, complete with comical music, that rather ruins the mood. The film is boosted by strong direction from experienced exploitation director Alberto De Martino, the action scenes are shot very well and he makes good use of the scope frame - this film would certainly look very poor if pan-and-scanned. There is some notable use of the zoom-lens in a few scenes, akin to Parolini's direction of the Sabata films. The sets and costumes all look strong and good use is made of the Spanish locations that give this film a very traditional Western feel. The stunt-work is quitesubdued, but Django does some hopping and flying about, particularly in the final bar-fight sequence. Dutch actor Glenn Saxson (best known as Umberto Lenzi's Kriminal) has a rare leading role here, making his an unusually light-haired Django, although it seems to fit with the lighter tone of the picture. Two of the most attractive Euro-cult stars, Erika Blanc and Ida Galli play the female leads while genre regulars Fernando Sancho, José Manuel Martín and Guido Lollobrigida play their parts well and future Euro-cult favourite George Eastman makes one of his first appearances in a brief cameo. Strongly directed, well acted and decently written, although with a poor ending, Django Shoots First is a pretty standard early Spaghetti Western, enjoyable but forgettable. Recommended to genre fans. Anyone famous in it? A solid cast but no-one well known. Any gore or violence ? Lots of people get killed, a little blood. Who is it for? Recommended to Spaghetti Western fans. The picture quality is decent, some light grain throughout and some occasional print damage. Audio Italian Stereo track, sounds fine throughout. Subtitles English - burned on. Cuts? Believed to be fully uncut. Print is Italian, credits and title in Italian. A decent Spaghetti Western with good cast and direction and a decent storyline - genre fans should enjoy this. The DVD print and audio are strong, although forced subtitles are not ideal and there are no extras. All text in this review written by Timothy Young - 1st July 2006.